"Good breakfast, dinner, or even dessert! The toppings make all the difference! 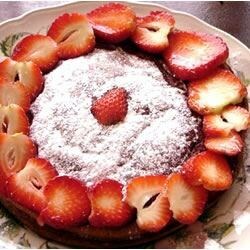 Sprinkle with powdered sugar and serve with syrup, fruit, or just by itself." Fantastic!! If a little cream cheese is good, more is better? OH YEAH! I doubled the cream cheese and it was wonderful. Like a real easy cheesecake. Thanks! This recipe was amazing! I have a family of 6 & everyone loved it. It looked beautiful too. It was easy to make and little clean up. I would give it 6 stars for uniqueness & originallity. This is a Christmas Morning Tradition. My kids, all in their 20's now, still request this for breakfast on Christmas Day. It's absolutley delicious! I actually made this for dinner and the whole family ate it. They were pleased and happy to have it. This is quite an accomplishment. Thanks for the recipe!